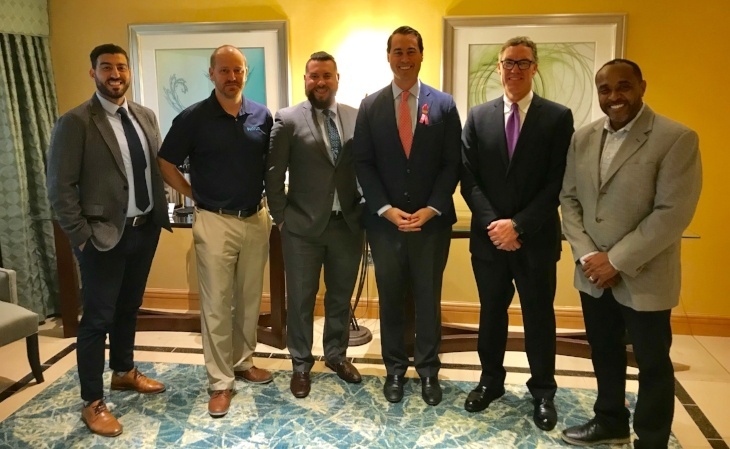 Yesterday, AEE Members met with Chris King, Democratic nominee for Florida lieutenant governor, and Chris Lipson, policy director for Democratic gubernatorial nominee Andrew Gillum to discuss policies that could accelerate the adoption of advanced energy resources and growing the number of advanced energy jobs in Florida. The business representatives discussed policy mechanisms and regulatory initiatives that a Gillum administration could utilize to ensure that Floridians reap the economic benefits and cost savings of advanced energy technologies – such as growing the 160,000 jobs now supported by the advanced energy industry in Florida. AEE member companies met with Republican nominee Ron DeSantis in August, prior to the primary election. Understanding the role that advanced energy could play in business development in resource-rich Florida, the business group encouraged King and the Gillum campaign to back policies to enable businesses to purchase renewable energy, electrify vehicles in the state, and increase support for energy efficiency investments by customers. These and other policies are laid out in the Florida policy roadmap shared with gubernatorial candidates earlier this year. AEE has posted online candidate scorecards in nine states, including Florida, along with profiles of advanced energy workers in those states. We will update the scorecards as candidates address policy priorities for growing the advanced energy industry in those states.